Put the spotlight on shine and clean up your act with Herbal Essences Dazzling Shine Conditioner that will make your hair shine like a star! All day and all night, that's 24-hour shine. This conditioning formula will let your beauty shine through while leaving your hair with its refreshing citrus scent that awakens your senses.tioner. All day radiant shine for your hair. Leaves hair with a fabulous silky shine. Enjoy bright Citrus essences. Refreshing effects. Put the spotlight on shine and clean up your act with Herbal Essences Dazzling Shine Conditioner that will make your hair shine like a star! All day and all night, that?s 24-hour shine! This conditioning formula will let your beauty shine through while leaving your hair with its refreshing citrus scent that awakens your senses. For better results use with Herbal Essences Dazzling Shine Shampoo. Simply apply conditioner generously to wet hair from root to tip, enjoy the scent, and rinse. 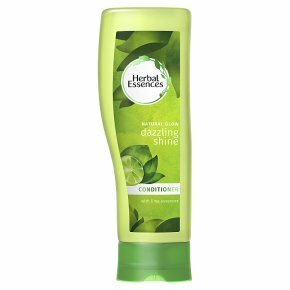 For more beautiful hair, use with Herbal Essences Dazzling Shine Shampoo.